Hi everyone, welcome to my fifth tutorial! This time I'm going to show you how I create the zigzag pattern using tape. It's not very hard but it does require some patience because it involves two times of taping and the layers of polish need to be completely dry in order to do that. To speed up the process I recommend using polishes that cover in one coat or a fast drying topcoat for on top of polishes with a longer drying time. So pick three colors and let's start! Begin with the base color you like (if necessary with a basecoat underneath) and let it dry completely. You can apply a fresh color or use the current polish you're wearing (to practice). Since there will be two more coats of polish applied on top, it doesn't matter if there's a little bit of VNL (visible nail line) or tipwear. Now cut some triangles out of tape to make the zigzag pattern. I do this by cutting a small piece off the roll first, which I then cut it in half diagonally.You'll need two triangles per layering color. When you're done cutting the tape, place two triangles next to each other on about a third of the nail, with the points towards the tip. Make sure all the pieces of tape are fully adhered to the surface, if not use your finger or a tweezer to push them down or reattach them if needed. ...and carefully peel off the pieces of tape right away. Let the design dry and if necessary use a fast drying topcoat to shorten the drying time. If you're starting to lose your patience by now, you can of course leave the design as is, which looks pretty cute already. Fanatics may continue with step 5! 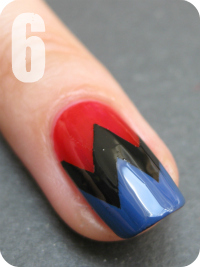 When the polish is entirely dry, repeat step 2, 3 and 4 with your second layering color, but now place the triangles a bit more towards the tip, partly overlapping the first layering color like shown in the picture. At last apply your topcoat, clean up and you are finally done! Don't forget to moisturize your cuticles afterwards, because having all that tape on your skin can make it a bit dry! Use the design for an eye-catching full mani or cut it down to a few accent nails if you want to keep it simple or can't be bothered. Thanks for reading! Check out the tutorial page for some useful tips. Also I would love to see your attempt on my design, so feel free to leave a link to your creation in the comment section! Polishes I used in this post are OPI Big Apple Red, Color Club Where's The Soiree? and Essence Chuck. Het ziet er zo makkelijk uit en dan probeer ik het zelf en dan mislukt het compleet! So thats where i was going wrong. I was peeling them off when it was dry and they were pulling at the edges. Will try it when wet now. Thank you. 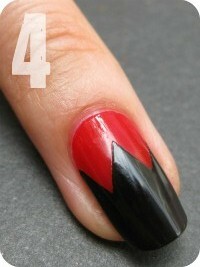 I loved how much the lightning bolt felt like a superhero mani (and posted my version of it on my blog!) but I like these even more... it'd be great with red blue and gold and the W for wonderwoman! i would try it but i know i'll embarrass myself. hahaha they're so lovely! I just tried this and I totally failed. I did 2 things wrong. 2. I used Scotch Tape. Bad bad idea. I tried it and the result was amazing!! !I can't wait to try the other desings!!! Just found your blog by happy accident--I am IN LOVE!! Your nails look like a million bucks--what a great way to have a fab mani and really only spend your time to do it! And your 4th of July mani--WOW!!! I totally love your blog. I've been following it since January! You have the most awesome ideas and I appreciate your very simple to execute tutorials!! Keep up the inspiration! Smells Like Teen Spirit won! Vote for my (first) franken!